How do we perform a very basic genome assembly from short read data? examine the output of the assembly. Velvet is one of a number of de novo assemblers that use short read sets as input (e.g. Illumina Reads). The assembly method is based on the manipulation of de Bruijn graphs, via the removal of errors and the simplication of repeated regions. For information about Velvet, you can check its (nice) Wikipedia page. For this tutorial, we have a set of reads from an imaginary Staphylococcus aureus bacterium with a miniature genome (197,394 bp). Our mutant strain read set was sequenced with the whole genome shotgun method, using an Illumina DNA sequencing instrument. From these reads, we would like to rebuild our imaginary Staphylococcus aureus bacterium via a de novo assembly of a short read set using the Velvet assembler. We will now import the data that we will use for the tutorial. Create and name a new history for this tutorial. Change the name of the files to mutant_R1 and mutant_R2. As a default, Galaxy uses the link as the name of the new dataset. It also does not link the dataset to a database or a reference genome. Inspect the content of a file. What are four key features of a FASTQ file? What is the main difference between a FASTQ and a FASTA file? In a FASTQ file, not only are the sequences present, but information about the quality of sequencing is also included. Why do we have 2 files here if we only sequenced the bacteria once? The bacteria has been sequenced using paired-end sequencing. The first file corresponds to forward reads and the second file to reverse reads. What is the coverage of my genome? How good is my read set? Do I need to ask for a new sequencing run? Is it suitable for the analysis I need to do? We will evaluate the input reads using the FastQC tool. This tool runs a standard series of tests on your read set and returns a relatively easy-to-interpret report. We will use it to evaluate the quality of our FASTQ files and combine the results with MultiQC. This is important in setting maximum k-mer size for an assembly. How long are the sequences? What is the average coverage of the genome, given our imaginary Staphylococcus aureus bacterium has a genome of 197,394 bp? We have 2 x 12,480 sequences of 150 bp, so the average genome coverage is: 2 * 12480 * 150 / 197394, or approximately 19 X coverage. Dips in quality near the beginning, middle or end of the reads may determine the trimming/cleanup methods and parameters to be used, or may indicate technical problems with the sequencing process/machine run. What does the y-axis represent? Why is the quality score decreasing across the length of the reads? 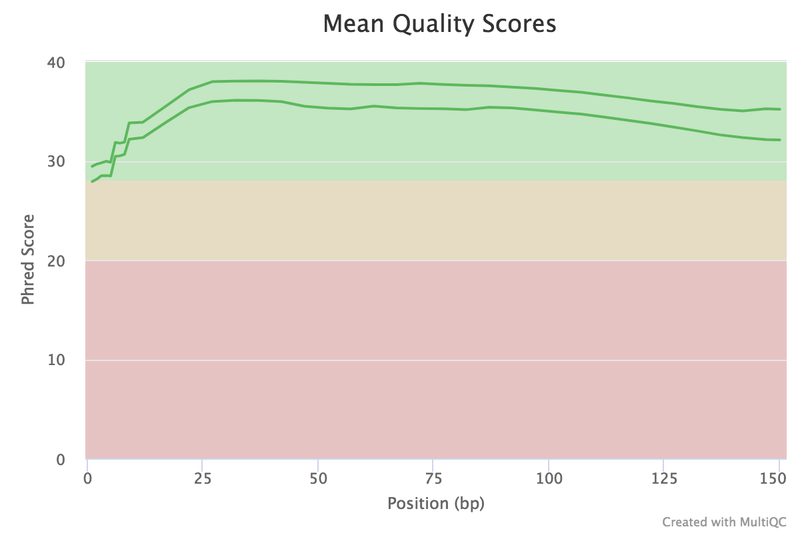 The y-axis represents the quality score for each base (an estimate of the error during sequencing). The quality score is decreasing accross the length of the reads because the sequencing become less and less reliable at the end of the reads. High GC organisms tend not to assemble well and may have an uneven read coverage distribution. The presence of large numbers of Ns in reads may point to a poor quality sequencing run. You will need to trim these reads to remove Ns. The presence of highly recurring k-mers may point to contamination of reads with barcodes or adapter sequences. For a fuller discussion of FastQC outputs and warnings, see the FastQC website link, including the section on each of the output reports, and examples of “good” and “bad” Illumina data. We won’t be doing anything to these data to clean it up as there isn’t much need. Therefore we will get on with the assembly! Now, we want to assemble our reads to find the sequence of our imaginary Staphylococcus aureus bacterium. We will perform a de novo assembly of the reads into long contiguous sequences using the Velvet short read assembler. The first step of the assembler is to build a de Bruijn graph. For that, it will break our reads into k-mers, i.e. fragments of length k. Velvet requires the user to input a value of k (k-mer size) for the assembly process. 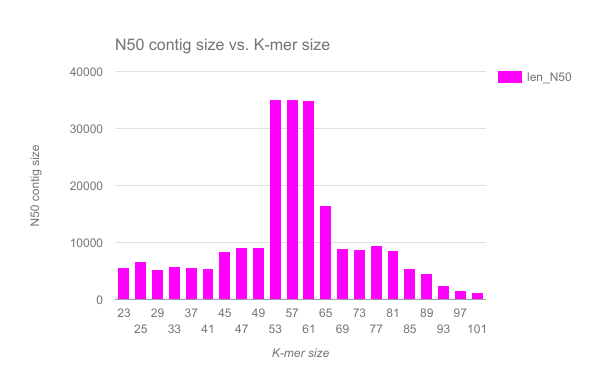 Small k-mers will give greater connectivity, but large k-mers will give better specificity. Currently our paired-end reads are in 2 files (one with the forward reads and one with the reverse reads), but Velvet requires only one file, where each read is next to its mate read. In other words, if the reads are indexed from 0, then reads 0 and 1 are paired, 2 and 3, 4 and 5, etc. Before doing the assembly per se, we need to prepare the files by combining them. The tool takes our reads and break them into k-mers. This last tool actually does the assembly. the k-mer coverage (called “coverage”): For the value of k chosen in the assembly, a measure of how many k-mers overlap each base position (in the assembly). This is a tabular file giving for each contig the k-mer lengths, k-mer coverages and other measures. How many contigs have been built? What is the mean, min and max length of the contigs? 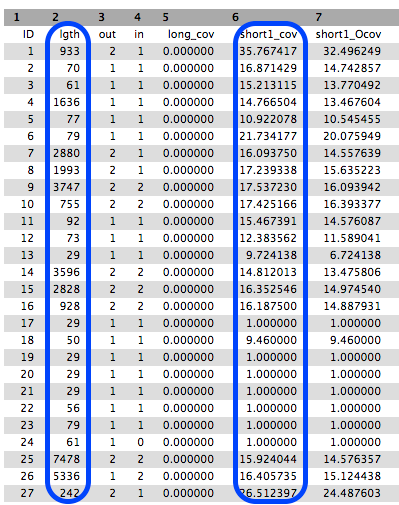 To compute this information, we can use the Datamash tool on the 2nd columns (length). Be careful with the first line, the header. As a result, we obtain: 597.82 as mean, 1 as min and 12904 as max. 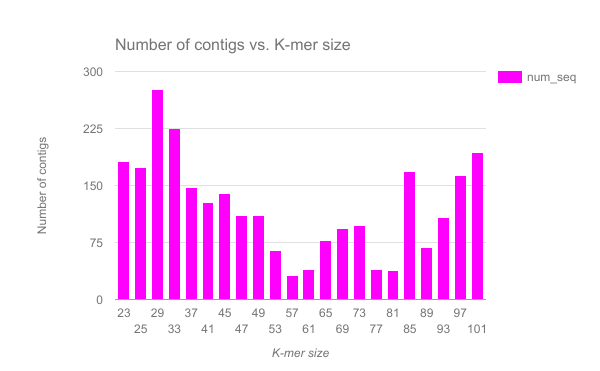 It would mean that the smallest contig has a length of 1 bp, even smaller than k. The length on the 2nd column corresponds to length of the contig in k-mers. 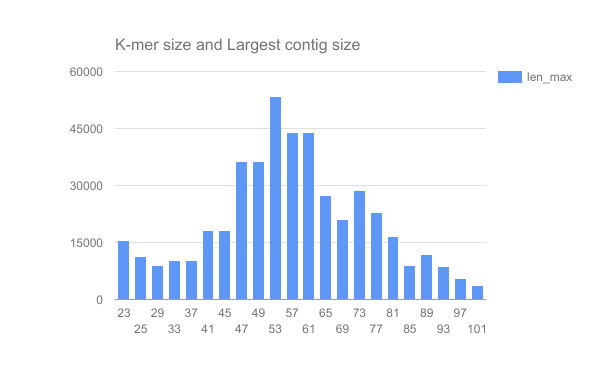 This means that the smallest contig has a length of 1k = 29. So to obtain the real length, we need to add k-1 to the length. We then obtain a mean contig length of 625.82 bp, a min contig of 29 bp and a max contig of 12,932 bp. This table is limitted, but we will now collect more basic statistics on our assembly. This tool generates 5 output files, but we will focus on the HTML report and the Icarus viewer. What is represented in the Icarus viewer? How many contigs have been constructed? Which proportion of the reference genome do they represent? How many misassemblies have been found? Has the assembly introduced mismatches and indels? What are N50 and L50? Is there a bias in GC percentage induced by the assembly? 190 contigs have been constructed, but only 47 have a length > 500 bp. The contigs represents 87.965% of the reference genome. 1 misassembly has been found: it corresponds to a relocation, i.e. 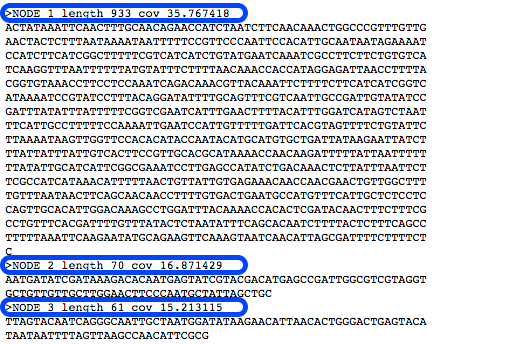 a misassembly event (breakpoint) where the left flanking sequence aligns over 1 kbp away from the right flanking sequence on the reference genome. 8.06 mismatches per 100 kbp and 4.03 indels per 100 kbp are found. N50 is the length for which the collection of all contigs of that length or longer covers at least half an assembly. In other words, if contigs were ordered from small to large, half of all the nucleotides will be in contigs this size or larger. And L50 is the number of contigs equal to or longer than N50: L50 is the minimal number of contigs that cover half the assembly. The GC % in the assembly is 33.64%, really similar to the one of the reference genome (33.43%). We have completed an assembly on this data set for a number of k values ranging from 29 to 101. A few of the assembly metrics appear below. Are there any distinct features in the charts? Does it look like one assembly might be better than some of the others? The reasons for these patterns will be discussed in detail in the De Bruijn graph assembly slides and tutorial. 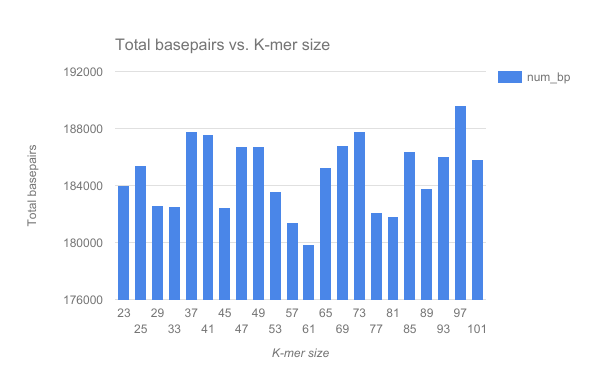 It looks as though there are some exploitable patterns in the metric data vs the k-mer size. This material is the result of a collaborative work. Thanks to the Galaxy Training Network and all the contributors ( Simon Gladman)!